Michael Bisping has had an impressive career in the UFC since winning the third season of “The Ultimate Fighter.” His quarterly ranking peaked at #5 in middleweight division in 2013. He is currently listed as #21 all-time in the weight class. However, he has struggled when facing higher level competition. On Saturday, at UFC Fight Night 84, he faces Anderson Silva. The former champion might be nearing the end of his career, but he is still one of the 15 best middleweights on the planet. In his last 18 fights, Bisping has faced nine fighters ranked in the top 15 and another nine ranked below. Against competition ranked below #15, he went 9-0. Against fighters in the top 15, he went only 3-6. The difference between the two stretches further from simple wins and losses. Against higher ranked fighters, his striking performance has suffered as well. To measure striking performance, the StrikeScore formula was applied to his last 18 fights. The following charts shows the breakdown of striking performance over that stretch. At the height of the UFC’s push into the U.K., it appears as if they wanted nothing less than to host a Silva-Bisping title fight in England. Unfortunately, Bisping was never able to earn that title shot. Saturday’s main event is not for the title. 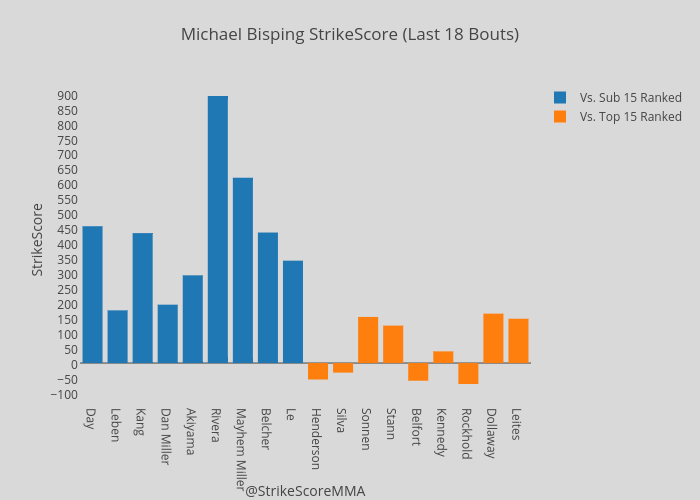 If Bisping can score a victory, it will likely be the biggest of his career. However, in order for that to happen, he must break his career-long trend of struggling against better opposition.